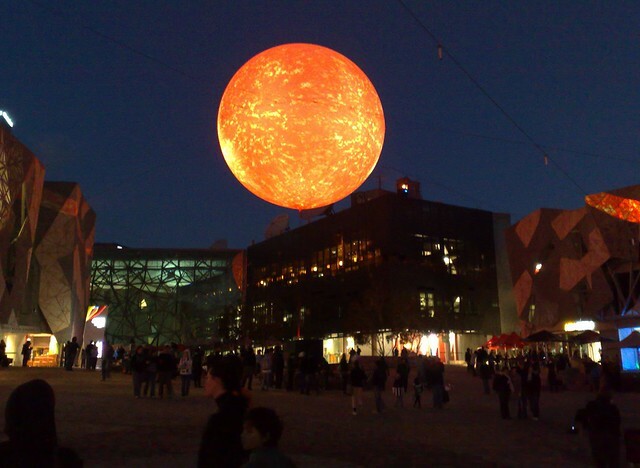 Solar Equation, by Rafael Lozano-Hemmer, part of Federation Square’s The Light In Winter, is a simulation of the sun, “100 million times smaller than the real thing”. I love this thing! It’s soo amazing. Have been over a few times already to play with it via the iPhone app (app is ‘Solar Equation’, funnily enough)…. Worth checking out for any Melburnians, ends in 2 weeks today. Cool! Errr… I mean, hot! … no sun spots i see! I want one in my backyard! Phillip, It isn’t fake. It really exists and on opening night it crashed. Oh wow! That’s amazing and freaky at the same time. Every time I stare at it, I feel like it’s a comet coming to crash onto Earth. 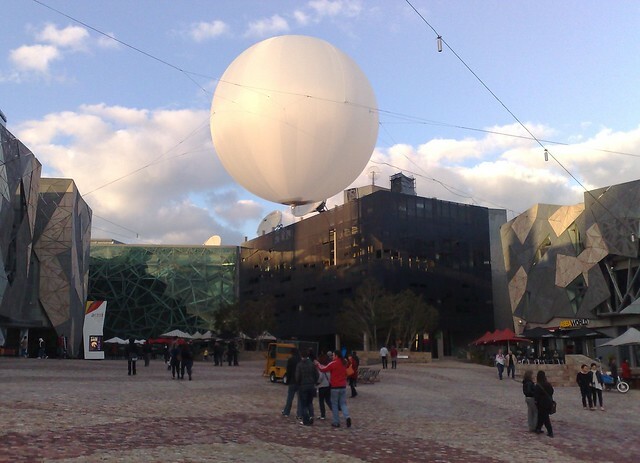 @Phillip, correct, there is not really a giant ball of fire hovering over Federation Square. @Chelsea, it’s well worth looking for video online, or going to see it yourself; it’s animated with sound. Very neat. I might check it out when I have the time this weekend. But I did go look for it in YouTube. Still amazing and a little freaky.